Well hello there, Blog Hoppin' friends! It's Amy from Step into Second Grade here :)) Today I want to talk to you about a student-generated alphabet! First of all, I'm just going to admit it right away.... making a student generated alphabet is something that I have to do in the Dual Language program... it's a requirement. BUT, over the past 4 years, I have really grown to love it. I love the kid art, I love that they are taking ownership of the resources/decor in the room, and I love how their little brains have to generate the words and pictures! 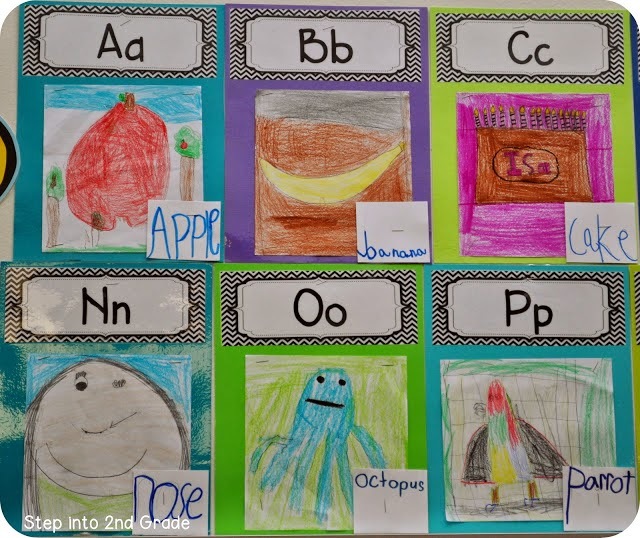 I knew from the get-go that I couldn't just have blank walls while waiting for my students to make the alphabet. After all, we have Meet the Teacher and the first week of school to get through, and my room must look decent during that time! So, I decided to make the alphabet headers, glue them onto cardstock, and laminate. This way all I have to do is staple up pictures. Now my alphabet papers can be used year after year! Once I have my kiddos for about a week, we start making our alphabet. I've done this in several different ways... we generate words for each letter as a class, students work together to come up with the words, or we use picture dictionaries to get our brains flowing! No matter which way we came up with the words, they all worked well! I must admit that I love how unique my alphabet is! It stays up all year, and just looks as cute as pie! I just give each student a piece of copy paper that will fit on my pre-made alphabet papers. I do a quick lesson on drawing pictures to where they are LARGE enough to cover up the paper, be seen from a distance, and look visually appealing to the students. We also talk a lot about adding backgrounds and coloring all of the empty space :)) I am pretty critical about pictures because these are going to be up all year long. I have some of my more detailed friends help finish out pictures and backgrounds because I do want it to look a certain way when finished! Scribbling and rushed work is definitely not allowed!!! 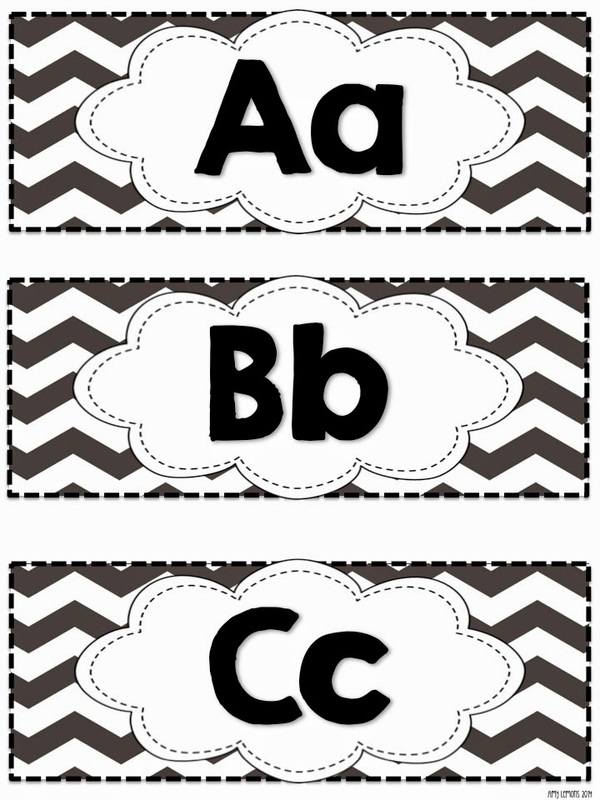 If you are looking for a way to get your kiddos more involved in your classroom alphabet, here are some headers that you can download for free! So cute that I want to try it with my older kids! We've been doing this for years in kindergarten. It really gives students ownership in the classroom. I'm so glad to see it being done in older grades. I also laminate my letters and use the background year after year. It makes it so much easier! Thank you! We actually have to do this in the building I am at this year. Thank you for the letters! I might just use those in my Word Wall this year! Thank you for the free headers! They are perfect for my room. Wow, what an awesome idea! I just love your alphabet wall!! What a great way for student's to take ownership of the resources in the classroom. Thank you so very much for sharing!! Can you please tell me where I might get a copy of the student generated alphabet headers in SPANISH HEADINGS?